Progress is a new international festival of performance and ideas produced by the SummerWorks Performance Festival in partnership with The Theatre Centre. Progress offers world-class performance at accessible prices. In curatorial collaboration with Toronto’s leading performance-based companies, we are presenting global dialogues driven by local voices. To purchase tickets, click on the show title above. You can also purchase a 3-show pass for $50 that will allow you to book a single ticket to any three shows. Click here to purchase a pass. Progress also features a number of free events. Click here for more info. Three figures run in a circle, struggling to continue as they spiral into the depths of Israeli consciousness. As their journey becomes harder and more painful, their stories break down, revealing the wounds of contemporary Israeli society. Combining dance, text, theatre, and grueling physicality, Marathon uses the autobiographical stories of the performers to reflect a state of constant emergency. Marathon is an exciting, visceral work that depicts the desperate need to hold onto ideas and ideals in an impossibly unstable world. Who will survive? And how? 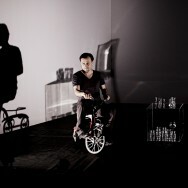 Marathon premiered at the 2012 Acco Fringe Festival, and has since been performed in Israel, Poland and Germany. Progress presents Marathon’s north American English language premiere. Following Toronto dates, the work will tour to Public Energy (Peterborough), the undercurrents festival (Ottawa), and the Chutzpah Festival (Vancouver). Marathon is co-presented with The Koffler Centre for the Arts, and generously supported by Spotlight on Israeli Culture, the Embassy of Israel, and the Israeli Consulate (Toronto). In 1932, American Psychologist Harry Harlow founded a Primate Laboratory at the University of Wisconsin-Madison, and created the first monkey breeding colony in the United States. Using a large population of newly born rhesus monkeys as subjects, Dr. Harlow studied infant relationships by replacing their mothers with artificial surrogates, made of cloth and wire. The Messiah Complex 5.0 utilizes the Harlow experiments as a point of departure to explore concepts of religious evolution. The first segment, The Artificial Mother, excavates the trajectory from idolatry to monotheism – using Harlow’s ‘Cloth Mother’ as a metaphor to explain the religious motivation for visual and tactile iconographies. The second segment, The Messiah Complex, unearths the mythological matrix of the messianic, involving themes of conception, birth, orphan upbringing, spiritual trials and tests all aligned with the trajectory of Harlow’s primate test subjects. The Messiah Complex 5.0 constructs a symphony of ceremonial techno- lectures hybridizing images, videos, diagrams and texts sampled from Pop Culture, Ancient Religion, Freudian Psychoanalysis, Archaeology, Queer Theory and Anthropology producing a trance-inducing Powerpoint-Sermon. Shapeshifting between human and primate, prophet and prostitute, animal and machine, Dudeck re-mixes information and histories in a stylized ritual that is hypnotic, immersive, and disturbing. The Messiah Complex 5.0 is produced by an imaginary institution, The Museum of Artificial Histories, which appropriates aesthetic strategies utilized by Dominant Knowledge Industries to excavate the mechanisms used to design and disseminate Grand Narratives. 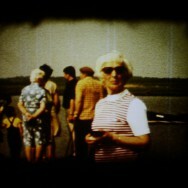 At an outdoor market in Berlin, theatre artist Janek Turkowski finds a set of private 8 mm films and a projector. For the low cost of 20 Euros, he takes the bargain home to Poland and begins to pour through the material. The films show a woman in East Germany, from the fifties and later, the sixties; the same woman on a bus ride, at work, in the woods, parades, scenery, parties – the sorts of things people film. Turkowski systematizes, digitizes, and looks for connections, and slowly he finds his way to the owner of the material. Margarete is a low-key, pleasant, and suitably nerdy performance. Turkowski places a small audience on chairs and cushions on the floor. He serves coffee and tea and lectures on his own slightly intense interest for this relatively coincidental and rather unsensational material. With humor and irony, Turkowski talks about the amount of time he has put into slowly uncovering and constructing stories from the material, leaving us with a reflection on the recording of memories and a private investigation into the identity of a person who left only a slight mark on silent film. Brazilian actor and director Enrique Diaz performs in a critically acclaimed adaptation of Daniel MacIvor’s “Monster”. Alone on stage, Diaz transforms himself into a series of MacIvor’s characters whose lives seem eerily related. There’s the young boy who tells the story of the neighbour lad who hacked up his father in the basement. There are alcoholic Al and whiny Janine, the lovers who quarrel, make up, and decide to marry after seeing a movie about a lad who…well, same thing. There’s the ex-drunk who dreamed up the movie, but got no credit because he was said to have stolen the idea from a famous unfinished film, a claim that so angered him that he went back on the sauce. And there’s the movie maker who made that incomplete epic. Cine Monstro represents the first time an English Canadian play will be presented in Canada in another language other than French. This is a rare opportunity to see Canadian theatre through a different lens. Presented by Why Not Theatre in association with Progress. Made possible through the generous support of the Department of Canadian Heritage. MONSTER was first produced by da da kamera at the Du Maurier World Stage in Toronto, 1998. MONSTER is staged by arrangement with Pam Winter, Gary Goddard Agency, www.garygoddardagency.com. On April 25, 2014, prominent Ukrainian theatre director, Pavel Yurov, was accused of being a spy and taken hostage by pro-Russian separatists in Eastern Ukraine. He was beaten and tortured for two weeks, but remained in captivity for more than two months. He was freed only when the Ukrainian government reclaimed part of the region in early July 2014 and he was able to return home to Kyiv. Yurov, originally from the Donbass region (Eastern Ukraine), was compelled to do something about the experience and collaborated with fellow theatre artist Anastasiya Kasilova to create a new piece, Novorossiya: No One’s Land. They built a documentary-style theatre work using found text from interviews with the Ukrainian and Russian press and various social networks. With Novorossiya: No One’s Land, Yurov and Kasilova are attempting to make sense of the conflict by investigating perspectives from two sides: Pro-Russian and Pro-Ukrainian. Novorossiya: No One’s Land is a theatrical and journalistic experiment-in-process that shares these first-hand narratives, and has Yurov asking: how did the place he once called home become his captor? Yurov and Kasilova have been invited to workshop Novorossiya: No One’s Land at the inaugural Progress. They will be presenting a public reading of the work-inprogress in English, workshopped and performed with local actors. The reading will be preceded by an interview with Yurov, and followed by a post-show discussion. In addition to the ticketed performances, there are a number of free events taking place as part of Progress. Silent Dinner is an 8-hour performance score in which the performers arrive to an empty space, collectively arrange a rudimentary working kitchen, prepare, cook, and consume a shared meal, all in complete silence. The participants are a combination of Deaf, CODA (children of Deaf adults) and hearing artists, performers and non-performers. Audience is free to come and go during the performance. Join Amanda Coogan and collaborators for a post-performance conversation. ASL interpretation provided. This conversation brings together artists who embrace the use of dance in performance as a means of articulating conditions of togetherness, be they joyful or traumatic. Featuring Progress artists Aharona Israel and Meher Awachri, Dancemakers Resident Artist Zoja Smutny, and facilitated by Dancemakers Curators Benjamin Kamino and Emi Forster. Dancemakers invites people – that’s you! – from any artistic background and with any level of experience to join them for a day of collaborative creation through dance-derived processes. At the end of the day, the public is invited to witness what’s been created as the seeds of initial ideas, and to share their thoughts with the makers. Alex Bulmer and Sarah Garton Stanley call for a rigorous and provocative discussion about the state of inclusion in our theatre community. A conversation for theatre makers, audiences, leaders, funders, all those in the performance world, and those who are being left out. The inaugural Progress is curated by SummerWorks, The Theatre Centre, Why Not Theatre, Volcano Theatre, Videofag, FADO Performance Art Centre, Dancemakers, Buddies in Bad Times Theatre, and Canada’s National Arts Centre English Theatre.